Do you need residential locksmith in Allentown, PA? Do you know who hold the key of your new home? With the continued economic downturn, numbers of burglaries and theft attempts are on the rise. So in order to prevent oneself turning into just a different crime statistic, it is crucial that you secure your home as fast as possible. 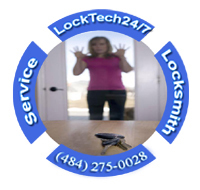 LockTech24/7 provides you with a quick and efficient residential locksmith services at a very affordable price. We serve the city of Allentown and metropolitan area, as well as Bethlehem and Easton, Pennsylvania. It is our goal to provide you with an excellent customer service. Your satisfaction is our benefit. We provide a full range of professional residential locksmith services. Our locksmiths respond to emergency lockout calls quickly and efficiently. We’re repairing broken lock, re-keying locks, extracting broken key, changing locks, and upgrading your security. If you lost, this is the time to call us to change your key and upgrading your security. 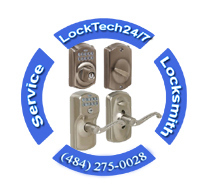 LockTech24/7 provides a full line of quality door hardware; door knobs, deadbolts, lever lock, garage locks, keypad locks, and more. Residential Locksmith in Allentown is Just Around The Corner. Let our experienced locksmiths take care of your security needs. So you can have peace of mind knowing your family is safe. It’s our quality of products and reputation that keeps our loyal customers repeating calling us time and time again. You always know you’re in good hands when you spot our trademarked quality residential locksmith services. Each of our vans comes fully equipped with the latest tools and technology. And we have the best machines in the locksmith industry today, to accompany each request on time. We provide top quality services for residents in Allentown and surrounding area. We’re on call 24/7, and arrive on time within 20 minutes. So you never have to be waiting long during an emergency locksmith situation. When you need residential locksmith services for your home, it’s important to find a reliable company. A company that offer you quality work of highly trained locksmiths, at a price you can afford. 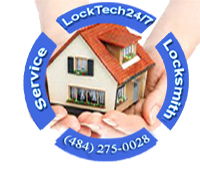 When you need a good locksmith company who can step in and handle everything you need taken care of in your home, contact LockTech24/7. We take a great pride in being able to handle such a variety of lock and key problems. As we take pride seeing you returning to us for locksmith services as you need in the future. You might not realize just how useful a residential locksmith can actually be until you need one. Especially if you’re a realtor or management company manager. When you do, why not contact the services of our Locksmiths? We’re only a phone call away and we are happy to assist you, any way we can. Our locksmith company offer full residential locksmith service and plenty of security solutions. For years now, we have been the company that our customers always know they can trust. 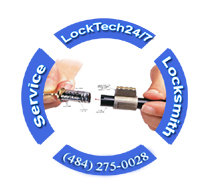 We will be there when you need lockout service, as well to re-key or replace your locks. Our local locksmith is still the best locksmith in this region, with the best prices for lockout and other locksmith services. We can add deadbolt on your door from scratch, drilling the door and aligning with the frame, too. Excellent Residential Locksmith Service is Only One Phone Call Away. Our reputation for excellence is unsurpassed and our availability 24/7 means we are always ready for every call. When you want better security for your home, do yourself a favor and depend on the services of the best and most widely used locksmith service in Allentown, Pennsylvania. We work hard to make sure that every customer is given the unique and the best quality of residential locksmith service. Whenever you turn to us for your service needs, you can be certain that the job will be done properly, on the spot. Are you locked out of your home, right now? If you’ve ever been locked out of your own home, you know how aggravating it can be. Don’t wait until the last minute; let our professional technicians help get you back safely inside. Our knowledgeable and friendly technicians are familiar with all types of residential services as well. If you need that emergency Pop-A-Lock service to get you inside, call us, and we will be there with you in a short time. We provide you with the finest lockout service, 24 hours a day, 365 days a year. Our work is never done, until you are safe and satisfied with our top notch services. Therefore, you might consider to call LockTech24/7 to rekey the locks on your doors! Rekeying normally refers to the ability to change a lock so that a different key may operate it. If you are moving into a new residence, whether new or previously owned, you need the peace of mind knowing that you have the only keys to your doors. 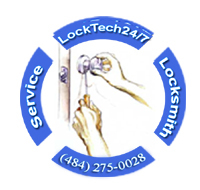 The residential locksmith experts at LockTech24/7 can re-key existing locks or provide you with a new key to your locks. Call us today and secure your family and your loved one. Re-key your old locks, protect your most valuable asset and live with a peace of mind! A new matching key will help keep your house safe and secure. Stop worrying about whom else has keys to your home. Re-keying your locks is your first line of defense against home invasion. How old are the locks on the doors of your house, are they working properly? It might be the time to replace the locks in your house..
Having the locks change done by LockTech24/7 locksmith is a better choice than doing it yourself or calling unprofessional locksmith. 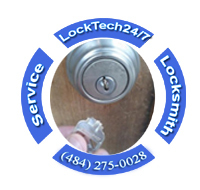 LockTech24/7 is the professional residential locksmith company in your first choice of call in Allentown, Pennsylvania. We believe in being fast, upfront and honest with our clients for price, which means that we will give you a fair quote in advance over the phone. Protect your home assets, protect your family! Call us now! Your keys are often to break inside the lock out of a crack on the key, or a bad weather. Unfortunately, there are some cases when you try to open your business door, and suddenly the key breaks inside the lock. It is a very unpleasant situation to have a broken key inside your door lock cylinder. In this case it is not recommended to try to extract the key yourself. Especially with standard tools such pliers or screwdriver, as it can push the key deeper and damage the lock. Simply call LockTech24/7 locksmiths and a professional technician will come and extract your broken key from your door lock. We have special tools to get it out for you. If we were able to extract the broken key and the lock is not damage it possible to re-key your lock. In addition, broken keys are not always possible to remove and in some cases destructive entry should be used to enter the property. From time to time, we need to drill the lock, too. If you have reached this page, chances are that you broke your key and you need help. If so, you have found the best solution because LockTech24/7 Locksmiths can help. Keypad is usually referred to keyless entry combination lock. If you like to get into your home without a key, then, you need to consider installing a new keypad entry lock on your door. With electronic keypad lock, keys are no longer needed, as long as you don’t forget to replace the single 9-Volt battery, every 2-3 years.